We've known about the so-called HTC Pyramid for months, long before the Vodafone leak this morning. 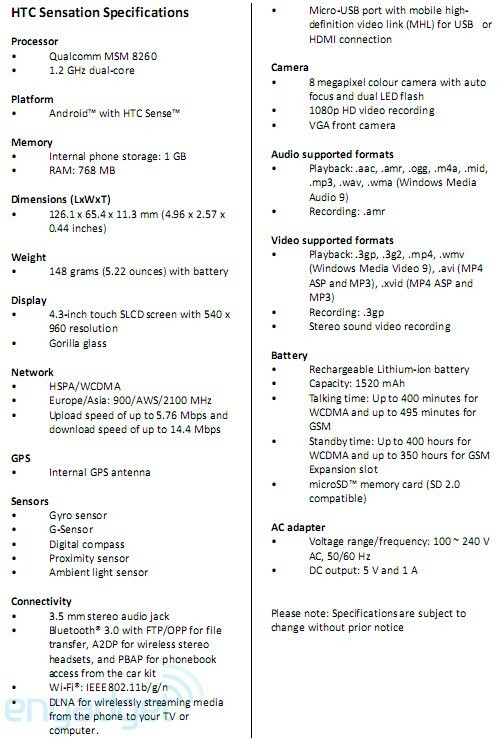 Now the long-rumored Android phone is official and coming to T-Mobile under the moniker HTC Sensation 4G. As expected, it matches many of the EVO 3D's specs, including a 4.3-inch (540 x 960) Super LCD screen, dual-core 1.2GHz Snapdragon processor, and Android Gingerbread (2.3) with Sense 3.0. But it one ups the 3D handset by bumping the rear lens' resolution to 8 megapixels, throwing in a second LED flash, and speeding up the video frame rate to 30fps at max 1080p resolution. Speed-wise, this HSPA+ device promises download rates as fast as 14.4 Mbps. As for Sense, the Sensation also ushers in various tweaks to the company's UI, including customizable lock screens, 3D transitions, an improved weather app, and HTC Watch, the service introduced with the company's Flyer tablet that lets you download DVD-quality movies. Before hitting the states this summer, the Sensation will launch in the UK, Germany, and the rest of HTC's "key" European markets in mid-May, with Vodafone scoring a Europe-wide exclusive for "a couple of weeks." We can't wait to put the Sensation through its paces in a full review, but happily we already scored some hands-on time with a near-final unit. Continue below the break for some early thoughts, full specs, and close-up shots of this superphone in action. Update: We scored some hands-on time with a European model over at HTC's launch event. Check the video here! We quickly warmed to the Sensation's contoured screen, whose concave shape and Gorilla Glass protection are designed to protect the precious device from picking up scratches when you set it face-down. As it happens, it's also ergonomically ingenious, and makes for a comfy touch experience. Thanks to that dual-core CPU the phone felt responsive as we poked around menus, while the aluminum back cover gives it a solid, weighty feel. HTC says it's also tweaked the algorithm in the onscreen keyboard so that it predicts words more accurately, though its appearance hasn't changed from what you're used to seeing in devices like the Incredible S.
The Sensation is narrower than the Thunderbolt (click the gallery for some comparison shots) with a 16:9 aspect ratio that pairs nicely with movies. Watch, the company's new service, has a catalog of 600-plus movies, which you can download to the handset's included 8GB microSD card and charge to either your carrier or credit card. Movie playback was smooth and clean, as was zooming through web pages, but video embedded on a page was a bit choppy. The problem with Watch though, is that the DRM on those movies makes it impossible to watch them on a larger screen using DLNA or HDMI-out. What the phone lacks in movie playback, though, it slightly makes up for in an improved camera. There's the higher resolution, sure, but HTC has also done a good job slashing shutter lag with a new "Instant Capture" feature. As for the Sense UI, the customizable lock screens are eye candy, for sure, but also let you insert widgets for weather, stocks, and social networking, which you can glance at before you unlock the device. Launching apps from the lock screen is as simple as dragging them into a so-called activation ring (we promise this makes more sense in practice.) The new 3D flourishes are pretty too, though they don't fundamentally alter the experience of flipping through the UI. Back in the realm of 2D, we did a double take when we saw a new home screen of Windows Phone-esque photo tiles. (HTC even uses that word to describe it!) Many of HTC's widgets, by the by, take up an entire home screen. Personally, we find that less distracting than Motoblur, which peppers the screen with lots of smaller widgets, but we know plenty of folks will disagree. The weather app is now full-screen, a convenient improvement over previous versions. And thanks, HTC, for adding hourly info. Sure, Sense already lets you set the refresh rate to one-hour intervals, but it's useful to see how the temperature might change throughout an afternoon. At first blush the Sensation 4G looks promising, delivering the power and design panache of the EVO 3D, but with a screen that's more utilitarian than gimmicky. Of course, we'll reserve judgment until we get to take one of these bad boys home and see if it can really sensationalize our lives. HTC Sensation 4G will be available in the US exclusively at T-Mobile USA beginning this summer. premium device that delivers a powerful and unprecedented smartphone to our customers." "The HTC Sensation 4G delivers the ultimate in speed and entertainment on America's Largest 4G network," said Andrew Sherrard, senior vice president of marketing for T-Mobile USA. "With a lightning-fast dual core processor and 4G speeds, customers will feel the difference when accessing rich media and content on the HTC Sensation 4G's beautiful qHD display. We look forward to adding the HTC Sensation 4G to our industry-leading lineup of 4G smartphones." 1.2-gigahertz dual-core Qualcomm® Snapdragon™ processor, which enables gorgeous graphics and all-around fast performance. Complementing the HTC Sensation's premium design is the latest HTC Sense experience that boasts a host of new features and enhancements, helping people to have more fun and get more done. For instance, HTC Sense introduces a customizable active lockscreen experience that transforms the lockscreen into a real-time window to the most important information and content, such as social updates, photos, weather or stock updates that are viewed by simply turning on the display. In addition, the new active lockscreen becomes a customizable gateway that lets people quickly jump to the most used features, like making a phone call, sending an email, taking a picture or anything else with the same quick gesture usually used to unlock the phone. For instance, the camera can be launched right from the lock screen with a single motion, saving precious seconds when you're trying to capture the action. Sharper graphics, vibrant animations and new widgets make HTC Sense look better than ever and, by continuing to focus on all of the aspects, both large and small, that make HTC Sense special, HTC introduces a more cinematic and immersive weather experience with stunning imagery and audible weather effects. other phones. With the new Video Trimmer tool, people can crop their clips to the perfect size for easy sharing with friends and family. The HTC Sensation is a smartphone that is built from the ground up for a sophisticated, evolved multimedia experience. The 4.3" widescreen display means that users can watch movies like they were meant to be seen – in their full cinematic glory, with no cropping or letterboxing. The HTC Sensation is also the first smartphone to feature HTC Watch – an application and service that puts an entire library of the latest, premium movies and TV shows right at your fingertips, letting people discover the latest video content in an easy and visually engaging way. HTC Watch uses progressive download technology that makes it possible to watch videos without waiting for a huge file to finish downloading. HTC Watch offers the choice of renting or buying videos, and if purchased, lets you watch them on up to five different HTC devices.